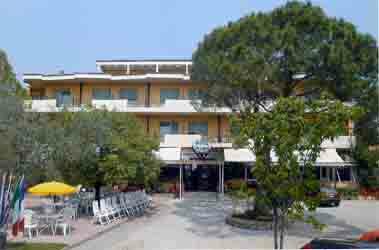 A cosy Hotel by the lakeside with garden facing the promenade and inner car park. An ideal place for a relaxing and pleasant holiday. hot water system, and with air conditioning system. Within walking distance are the beach with facilities (at 200 m), the centre of town (at 300 m), the ferry to Torri del Benaco on the Veronese shore of the lake (just in front), and the public boat service for enjoyable trips on enchanting Lake Garda (at 150 m).